Kilmarnock striker Josh Magennis has claimed he was racially abused by a fan at Tynecastle. The 25-year-old Northern Ireland international is alleged to have been abused by a fan in the Wheatfield Stand after his side’s 1-0 defeat in Edinburgh. Celtic winger Patrick Roberts has laid out the expectations he has set for himself as a Manchester City player after the loanee called training with his team-mates south of the Border a “joy”. Roberts completed a £12 million move from Fulham to Manchester last summer, but is in the middle of an 18-month spell at Parkhead. Rangers’ James Tavernier has spoken of his side’s determination to avoid route one football, which was made all the more resolute after an incident where he took a long throw-in at Livingston in a November league game. 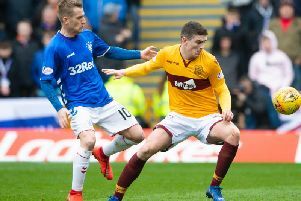 The right back has said that Ibrox boss Mark Warburton has since made sure Rangers don’t resort to such tactics if they struggle, as they did in that 1-1 result. “In the Livingston game we started to cross the ball in when we shouldn’t have crossed it,” he said. “We started to do things we normally didn’t do, even if we didn’t necessarily launch the ball. Ronny Deila has been accused of committing managerial suicide after failing to give his backing to Celtic defender Dedryck Boyata when he was sent off against Hamilton in a 1-1 draw. Chris Sutton says Deila left his defender “out to dry” – and that he was also wrong to admit that Boyata deserved a red card because he had in fact touched the ball. Rangers boss Mark Warburton has refused to accept that the Scottish Championship title is their, even as his side opened up an 11 point lead over nearest rivals Hibernian. As Rangers won 1-0 against St Mirren, Alan Stubbs’ side slipped to defeat at Dumbarton.